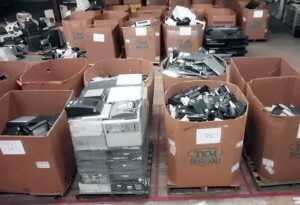 We provide computer and electronics removal and recycling. Electronic equipment eligible for removal and recycling could include computers, mainframes, workstations, telephone systems, typewriters, test equipment, or any other surplus electronic waste. Our professional crew will quickly and quietly remove your items directly from your office with no disruption to your business. Once we finish equipment removal from your facility, we will sort it out at our warehouse and process any hazardous materials properly to insure no hazardous material is just thrown out and ends up in a land fill. All monitors are processed to EPA guidelines and all printers and toner are handled in an appropriate manner. All disk data is destroyed.